knick*knack*shack has no other items for sale. 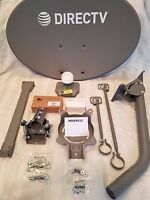 DIRECTV SLIMLINE HD COMPLETE/4K-UHD DISH KA/KU 3D2RB LNB/DSWM/4 WAY SPLIT/NEW! DirecTV SWM SWiM GREEN LABEL 21v POWER INSERTER PACK 21 VOLT PI21R3-16 NEW!!! Much like Timex-takes a licking, and keeps op ticking!!! 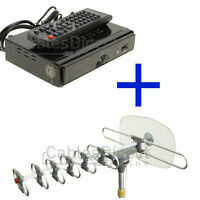 There are currently two models of "free-standing" receivers that DirecTv is using - H24 & H25. (By "free-standing" I am referring to "independent" receivers vs. Clients, which depend of a Genie unit to function). Overall, there is one major drawback to H25 vs. H24, and that is - H25 will only work with a SWiM system, while H24 will work with anything out there, including Legacy dishes. And with the coming-up total "termination" of any and all Standard Definition receivers, people who do not wish to change out their dishes, can simply replace their no-longer supported receivers with an H24, but not H25. On the other hand, being a two-box system, i.e. having an external power supply, an H25 has an overall much lower frequency of failure, since NOT everything is thrown into one "box". And since DirecTv pretty much adopted an all-SWiM policy sometime ago, all of the relatively recent systems, as well as those "going into the future", would be repairable with an H25 - whenever such a need arises. And, speaking from personal experience, as well as some other installer-friends, I have not had even one H25 fail on me. And that does say a lot, since they have been out since around 2010! So, in conclusion, buy with confidence this worry-free receiver!!! It was simple to install and simple to register. I love the slim design. It fits behind the flat screen, so there are no visible wires or boxes anywhere. Just a flat screen and a remote.